Technics reveals SL-1210GR turntable, on sale April for £1299 | What Hi-Fi? Technics has added a black SL-1210 model to its new range of GR turntables, and confirmed the all-important price and release date information for both the SL-1210GR and SL-1200GR. Following the launch of the SL-1200GR at CES at the start of the year, Technics has announced the SL-1210GR – a black version of the new GR turntable, and the first new SL-1210 turntable for ten years. Both the the silver SL-1200GR and the black SL-1210GR will go on sale in April, costing £1299 each. The two new Technics turntables sit below the SL-1200G, which went on sale last year for £2999, and is only available in silver. The 1200GR and 1210GR share the same specifications, with the only difference being the choice of finish. The Technics GR turntables sport a high-rigidity, two-layer design chassis, with an aluminium platter and BMC base. By contrast, the more expensive SL-1200G has a brass platter. There's a coreless direct-drive, single rotor motor, as opposed to the twin rotor found on the more expensive model. The platter weighs in at 2.5kg which, along with its aluminium-and-rubber construction, is designed to eliminate resonance. The turntables claim a torque of 3.3kg/cm and come with a low-mass, high-rigidity aluminium tonearm that's assembled, fitted and balanced by hand. There are detachable cables on the SL-1200GR and SL-1210GR, a first for a Technics deck, plus gold-plated phono- and grounding terminals. The familiar +/-8 pitch controls (with a 2x option) are of course present and correct. The SL-1200GR weighs 11.2kg, while the platter is 2.5kg (including the rubber mat) – 0.8kg heavier than that of the previous SL-1200MK5. This compares to 18kg and 3.6kg for the reference SL-1200G. MORE: The best Technics turntable ever made? Launching the new SL-1210GR, Technics said sales of the £2999 SL-1200G had "surpassed our expectations". But will you be queueing up for the new £1299 SL-1210GR? 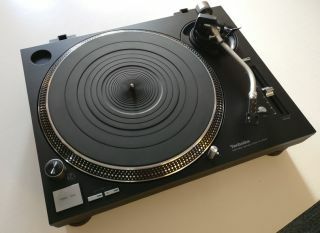 Or indeed the SL-1200GR? Black or silver? Let us know in the comments below.